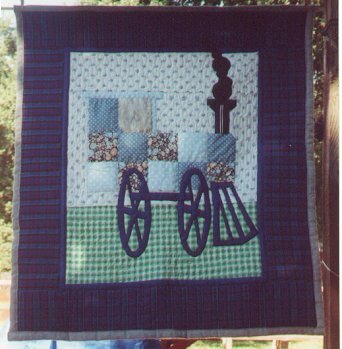 This is a pattern by Marjorie Rhine of Quilt Design Northwest and can be found at QDNW Designs web site. [update: it appears that this pattern is no longer offered on the site but there are a LOT of other very lovely quilt patterns.] Occassionally, Marjorie asks for beta testers of her designs. I happened to be in the right place at the right time and was accepted to be a beta tester for this pattern. I made this baby quilt from the contents of my stash, was pleased to complete it and gave my feedback to Marjorie. The reason it's called the "Millenium Train" is because one version of the pattern uses the two wheels as two zero's of the year 2000! Very clever! Unfortunately, I didn't really have a need for a baby quilt and really didn't want to have it hanging around.